Choice Privileges has launched their summer promotion that is valid for stays between June 12 – August 17, 2018. Members earn minimum of 5,000 and maximum of 8,000 bonus points for every two stays (depends on the number of base points earned) that can be used for free nights or discounted gift cards. This is very typical promotional from Choice Privileges. I would say that considering all the point inflation since these offers were originally launched they really should look into raising the payout to keep them competitive. Registration required at ChoiceHotels.com/giftcard before check-out. Promotion is only available to members of the Choice Privileges Rewards Program. After a second qualifying stay with arrival between 06/12/2018 and 08/17/2018, members will be awarded a minimum of 5,000 and maximum of 8,000 bonus points, depending on the number of base points earned from the two (2) separate qualifying stays. The bonus points awarded are enough to reach the 8,000 point level, which can be redeemed until 09/30/2018 for one (1) $50 gift card at selected retailers. A selection of gift cards is available at the discounted redemption rate of 8,000 points during the promotion period. Please see a list of participating retailers here: ChoiceHotels.com/giftcard. 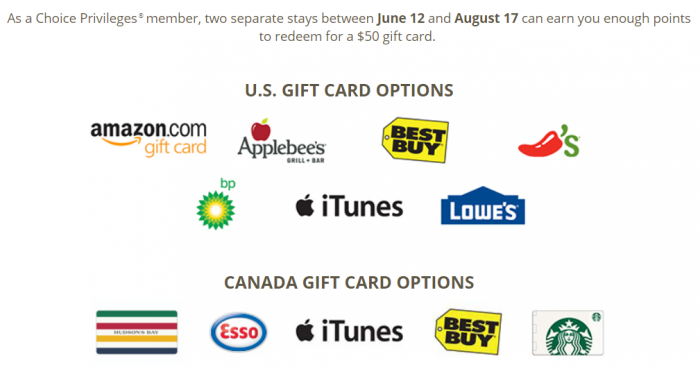 Terms and conditions apply to $50 gift card options. See card for details. A stay is defined as any number of consecutive nights at one hotel regardless of check-ins or check-outs. Members must book stays via ChoiceHotels.com, the Choice Hotels mobile app, or 800.4CHOICE at qualifying rates. Corporate travelers may book through their online booking tool, GDS, or with a travel agent. Choice Privileges member number must be provided upon check-in. Stays at vacation rental property locations and stays booked with the SEGEN and SRTLG rate codes do not qualify for promotional bonus points. To be eligible to earn the bonus, members must set their earning preference to Choice Privileges points in their online account. Any change made to earning preference will remain in effect after the promotion has ended. Allow 72 hours from check-out for points to post. Requests for bonus points made by members who did not register for the promotion will only be honored up to 60 days after the promotion ends; requests thereafter will be denied. You must maintain an address in the U.S. (including U.S. territories) or Canada to be eligible for this promotion. Choice Hotels reserves the right to amend these terms or terminate this promotion at any time. Hotel participation may vary. For Choice Privileges program details, eligible rates, eligible countries and point redemption rules, visit http://www.choicehotels.com/CPrules. Hotels are independently owned and operated.